Home Electro Harmonix Memory Boy Deluxe Give Away! Electro Harmonix Memory Boy Deluxe Give Away! Wow! I’m super excited with this give away. I know a lot of people are wanting this pedal, and this is your chance to own it for FREE! I was able to talk with Brad at Tone Factor to see if he would be interested in sponsoring another give away (He put up the Mojo Hand Sugar Baby last Fall and that was a great give away as well). I was pleased to hear that he was into it. I asked what pedal he would like to give up for the pedal give away, and the Electro Harmonix Deluxe Memory Boy came up, so here we go! 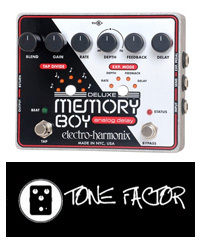 The Deluxe Memory Boy is the newest member of the iconic Memory Man family. It carries on the family tradition with new performance aspects that give it unique power and metronomic definition. Quality IC’s deliver warm and organic tones while the new Tap tempo allows you to always be in perfect sync with the groove. Choose from five note divisions for metronomic variance while staying in sync and always on the mark. The added EFX loop integrates your pedals to follow the groove with tonal dexterity .Use an expression pedal to control your modulations for performance flexibility. The Deluxe Memory Boy is slick, smart and always on time. Okay, now to the give away. So how do you enter yourself to potentially win the Electro Harmonix Memory Boy Deluxe Give Away? Second, fill out the form below, in two weeks (May 5th) I’ll randomly pick 3 entries as finalists. I’ll email the 3 finalists and the first one out of the 3 that emails me back will be the winner.You must enter a ‘valid’ email address, bounce back emails will be rejected. One entry per person. After the winner has been notified and all is good (I’ve retrieved mailing address, etc), I’ll coordinate with Brad at Tone Factor to get the pedal shipped to the winner. The first pedal I owned was a Gretsch Expandafuzz – the big aluminum box with tone controls. Sounded cool, very versatile, but within a year it totally fell apart, once the sides broke off. Wish I still had it! Did you submit an entry with the form above? my first pedal was a Boss Blues Driver. I liked it at first, came to hate it, and sold it. Thanks for bringing that to my attention. It’s fixed in Chrome now. Can you resubmit your entry? I’ll be referring to the email submissions when I pick the finalists. DOD Delay pedal. I still own it but it’s been in my closet since I upgraded to a carbon copy delay! Thanks for commenting, but please remember to submit the pedal via the form above. I won’t be checking the comments… only email for winners.